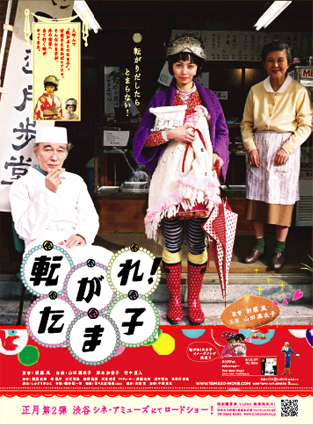 Tamako lives with her Mom who runs a beauty shop and a young brother, a high school student. When she was very young, her Dad moved out of the house while she was playing hide and seek with him. Since then, she distrusts people and withdrew herself into her own world. Whenever she steps out of her home, she wears an iron helmet. Neighbors call her a princess in an iron helmet. Sweet buns, that’s what Tamako loves most. She has grown up on the sweet buns that an old man has been making at his bake shop. Lying down on the bed, she indulges in sweet buns. That is when all her fears and anxieties are gone and she feels most blissful. Taking sweet buns with her, she goes to see her father at his shop. That has become her daily routine. Her father is a dreamy character who runs a mechanic shop during the day and works on an art object during the night. Tamako lives in a small world within a 500-meter radius, which is her triangle zone; the beauty shop, the mechanic shop, and the bake shop. She has not stepped out of that small world for a long time. But one day, Tamako discovers her mother falls in love with a guy she knows. Moreover, the bake shop temporarily closes its business due to the old man’s sudden illness. To makes the situation even more shocking, she finds her homebound cat gone from her house. All of a sudden, her secure and comfortable world begins to tumble down. Tamako craves for a sweet bun and decided to step into a world she’s never been…..